1. Switch ignition to the ON position (don’t crank engine). 2. 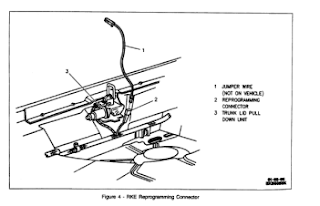 Locate the Programming Connector (See item 2 in Figure 4) at the back end of the trunk base (not the trunk lid) above the rear bumper. You may have to pull back the trim to access the connector. It is a plastic connector with one wire leading up to it that is NOT plugged into anything. 3. The connector should have one terminal. Ground this terminal to a suitable location (bolt, antenna, etc.) and keep it grounded until you're done with the programming sequence. Within 2 seconds of grounding the programming connector, the door locks will automatically cycle (lock then unlock) indicating that the system has entered programming mode. 4. Press the UNLOCK button on the first remote TWO TIMES (pause one second between presses). In response, the door locks will cycle once (lock then unlock) within 2 seconds. 5. If a second remote is to be programmed (including your old one), press the UNLOCK button on the second transmitter TWO TIMES, pausing one second between presses. In response, the door locks will cycle once within 2 seconds. 6. To turn off the programming mode, remove the jumper wire from the Keyless Programming Connector and switch ignition OFF.